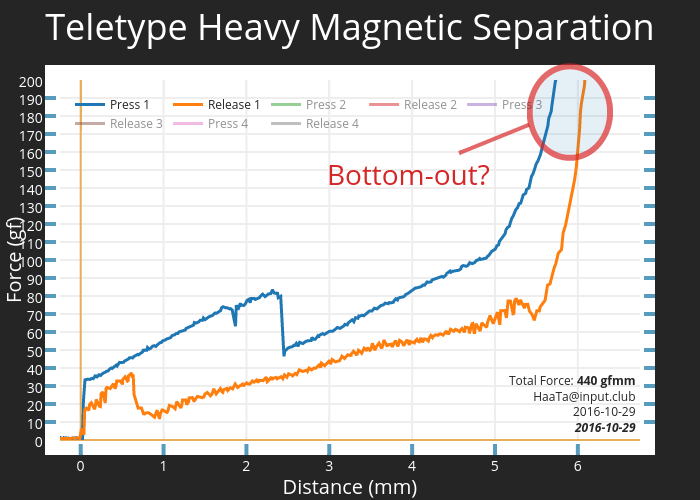 Haata's interactive graph and data of "Teletype Heavy Magnetic Separation" is a scatter chart, showing Press 1, Release 1, Press 2, Release 2, Press 3, Release 3, Press 4, Release 4; with Distance (mm) in the x-axis and Force (gf) in the y-axis.. The x-axis shows values from -0.25 to 6.75. The y-axis shows values from 0 to 200. This visualization has the following annotations: Total Force: 440 gfmmHaaTa@input.club2016-10-292016-10-29; Bottom-out?